Being in a motorcycle accident is can involve numerous medical bills, lost wages, and can affect a person’s life. This is what happened to our client, Dakota. What seemed to be just another motorcycle drive resulted in a very painful situation. Dakota was driving in on the road one day. He was following all of the rules a motorcyclist should follow. Everything seemed to be going as planned when a driver failed to stop at a stop sign and started to turn left. Here’s when everything changed. The vehicle got in the way of Dakota’s path, which caused Dakota to hit the vehicle, flip over the driver’s vehicle, and sent Dakota flying. The impact was so strong that Dakota’s motorcycle caught fire and Dakota had to be airlifted to a nearby hospital because of his injuries. Dakota stayed overnight in an emergency room, where a doctor diagnosed with loss of consciousness, contusion of the right ankle, blunt abdominal trauma, and other serious injuries. Dakota started to receive physical therapy for his injuries when he went to a neurologist for an examination. There, Dakota was diagnosed with a traumatic brain injury, amnesia, and stress. In addition to this, Dakota received interbody fusion on a herniated disc and other procedures on his spine. In addition to the mounting amount of medical bills that the accident involved, Dakota suffered from pain and suffering and could not properly perform at his job due to his injuries. Dakota knew he needed a fighting attorney on his side, which is why we took care of him from start to finish. 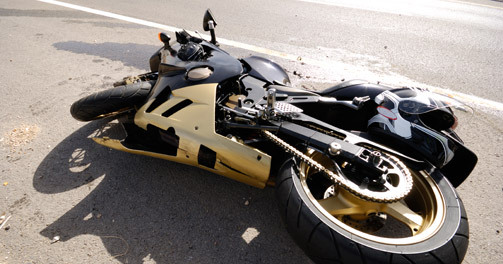 A personal injury case involving a motorcycle accident should be taken very seriously. That is why the attorneys and legal team at the Anderson Law Firm did everything to make sure Dakota was well taken care of. This included schedule medical appointments and handling all of his legal paperwork. We represented Dakota’s right as an injured motorcycle accident victim, and we fought the insurance company until they gave us the settlement offer Dakota deserved. Our attorneys were able to win Dakota with a $100,000 settlement. Dakota was now able to recover without having to pay for medical expenses for an accident that was not his fault.